The Samsung SCX-5530FN is a multifunction monochrome laser printer that includes scan, fax and copy functions with durability, speed and convenience. This model offers various copy features, Optical Character Recognition for scanning text documents, automatic duplexing, high paper input capacity and digital fax technology. 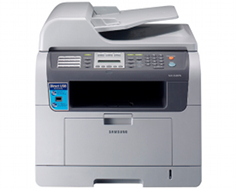 The Samsung SCX-5530FN can also scan documents to email, network or a USB flash drive. A multitude of functions can be performed via a connected PC or directly through this model's control panel. The Samsung SCX-5530FN can print at speeds up to 30 pages per minute, which is considered faster than most multifunction units in its class. Duplex printing is as fast as 21 pages per minute. An effective output resolution of 1,200 dots per inch, which is comparable to most similar models, ensures business-quality document reproduction. First page out time is less than 8.5 seconds, rivaling that of most industrial grade laser printers and copiers. Copy speeds are as high as well, at up to 30 copies per minute for letter size documents. Platen copy resolutions are 600 x 600 dots per inch for text, 600 x 300 dots per inch for combined text/photo mode and 600 x 600 dots per inch for photo only. A resolution of 600 x 300 dots per inch from the automatic document feeder adds speed and automation to output quality. An embedded digital color scanner that is TWAIN and WIA compatible can render an optical resolution of 600 x 1,200 dots per inch and an enhanced resolution of 4,800 x 4,800 dots per inch, ensuring quality digitization of both text documents and full color photos. A fully functional digital fax module with a modem speed of 33.6 Kbps can transmit documents at approximately 3 seconds per page and 6 MB of fax RAM can store approximately 480 pages of letter sized content. The Samsung SCX-5530FN has a standard input capacity of 300 sheets, divided between a 250 sheet cassette and a 50 sheet multipurpose tray. An optional 250 sheet cassette can be purchased to increase the maximum paper input capacity to 550 sheets. The main paper input tray is rated to handle document sizes from A4 to letter to legal and the multipurpose tray can accommodate sizes ranging from 3 x 5 in. to 8.5 x 14 in. legal size. The multipurpose tray can accommodate a wide range of media such as plain paper, transparencies, envelopes, label sheets, card stock, cotton, pre-printed and recycled. 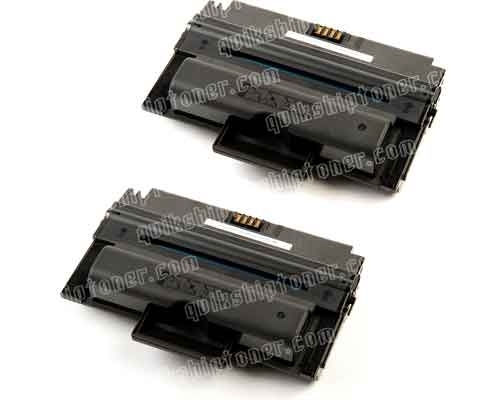 64 MB of onboard printer RAM can be upgraded to 96 MB with an optional 32 MB DIMM module. Connection interfaces include USB 2.0, parallel and 10/100Base-TX embedded Ethernet, providing connectivity with both newer and older computer systems. The Samsung SCX-5530FN is compatible with Windows XP, Mac OS X and various builds of Linux. The 256 available levels of grayscale can cause black and white scans and copies to appear grainy and pixelated due to the limited print resolution that is possible. This model is best suited for scanning to a file rather than a hard copy. Despite being advertised as a device that is capable of business quality speed and results, the standard and maximum paper input capacities, as well as the 150 sheet output capacity, are both really low and any type of high volume printing would require almost constant attendance. The main paper tray is only capable of handling plain paper and cannot accommodate other types of media such as envelopes, requiring manual feeding through the multipurpose tray. The main tray is also limited to document sizes and does not accommodate half pages or any non-standard sizes. Review it: "Samsung SCX-5530FN "
The Samsung SCX-5530FN comes with a starter toner cartridge that has an average yield capacity of 4,000 pages at 5% coverage. Replacement cartridges can be purchased at the standard yield capacity, or a high yield toner cartridge can be purchased that has an average yield capacity of 8,000 pages at 5% coverage. 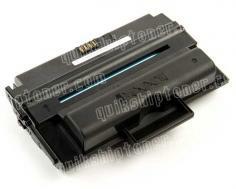 At average prices, toner costs are as low as one cent per page.